Coral Forever 21 Skirts first surfaced on Chictopia's streetstyle gallery in Summer 2011 seen on blogger VesperLynd of vehementlyvesper.blogspot.com. She wore her coral Forever 21 floral print skirt with a tan Steve Madden platform shoes, black thrifted vintage satchel bag, and dark brown Urban Outfitters round tortoise sunglasses. Since then, Coral Forever 21 Skirts have grown in popularity as bloggers from Puerto Rico, San Francisco, and Washington have discovered them. Coral Forever 21 Skirts are generally seen in chic, romantic, and casual style. Popular types of Coral Forever 21 Skirts are floral print, floral skirt, maxi, pleated maxi, and bodycon. 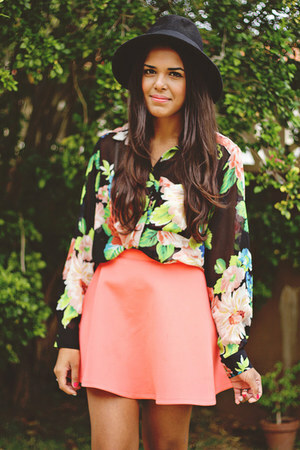 There are currently 28 streetstyle photos of bloggers wearing Coral Forever 21 Skirts. Most recently, blogger lapetiteconteur of lapetiteconteur.com rocked her coral Forever 21 maxi skirt skirt with a pink Forever 21 floral headpiece hair accessory, black Tobi crop top top, and black Jeffrey Campbell litas heels.